To understand the key concepts of Citrix XenApp, an analogy will be used whereby how a farm called Pinklebury farm operates is compared to how Citrix XenApp operates. Pinklebury farm is owned by farmer John, the farm has over 200 chickens in a single chicken coop and they produce around 500 eggs each day. Farmer John has an assistant, his son, Tony who is the lead farm hand. Tony keeps tabs on the state of the chickens and how the other farm hands are doing. Johnny, Farmer John's second eldest son also helps as a farm hand and when Tony is not well, Johnny takes the lead farm hand role and steps in to do the duties his brother Tony would normally do. Two other farm hands, Paul and Peter also help keep the chicken's producing eggs. The farm has a shop, where all the eggs are sold. The shop is at the entrance to the farm and the farmer's daughter, Emily works in the shop. Emily is responsible for making sure there are enough eggs in the shop to sell. Michael, Farmer John's youngest son works as a farm hand but also works with Emily. He tells Emily how many eggs and which types of eggs are available, he gets this information by asking Tony. To keep tabs on how much stock is available and how much is being sold, Lisa, the farmer's youngest daughter keeps detailed records. Before the farmer John could set up his egg shop on his farm, he had to get a license from the Ministry of Agriculture. This license sets out the maximum number of people who can use the shop at anyone time. Farmer John can operate his farm for 30 days without needing to contact the Ministry to renew his license, after which the farm will be closed down immediately if the license is not renewed. The Pinklebury Farm screenshot above provides an overview of Pinklebury farm and the people who work there. Now compare how Pinklebury farm operates to the key concepts used with Citrix XenApp. The Citrix XenApp servers can be compared to the chickens at Pinklebury Farm, whilst the chickens do the job of providing eggs for customers, the Citrix XenApp servers provide applications for the users (customers) to use. 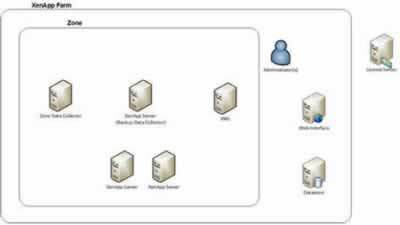 The concept of a 'Farm' was also used in older versions of Citrix XenApp to define an area of responsibility and a boundary. Just as Pinklebury farm is the boundary of responsibility for farmer John, the Citrix XenApp Farm was responsible for the Citrix XenApp servers and other components within it. The Citrix Farm concept has been superceded by the 'Site' concept in later versions of Citrix XenApp but in essence this is still a boundary just like the 'Citrix Farm' concept. The farm hand Tony collects information about the chickens, primarily around their capability, that is how many eggs they are producing. Tony's role is similar to the Collectors role in a XenApp Site, where information on the availability of resources from the XenApp servers is assessed. Just as Tony keeps the information about the chickens in his memory, the Collectors do the same. They keep a watch on how each of the XenApp servers they are responsible for are performing. In XenApp terminology the chicken coop is represented by a zone and each zone has a Collector for that zone. Just as Pinklebury farm has a backup farm hand in the likes of Johnny, who helps when Tony can't work, the XenApp farm can also have a backup Collector for each zone, which can step in, should the preferred Collector stop working. The XenApp Site also has a sort of shop front for customers and this is web based and commonly referred to as a portal. 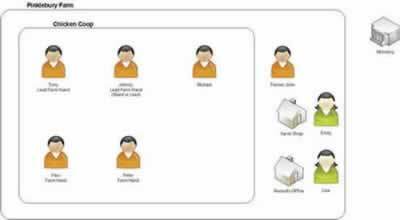 The portal is a web interface to the XenApp farm and the component which provides the portal capability is called the StoreFront. The StoreFront uses a broker to find out what applications are available for users to use, this broker is known as the XML broker. The XML broker functionality is provided in Pinklebury farm by Emily, who can check with the farm hand, Tony, to see what eggs are available. With a Citrix XenApp Site, to keep tabs on what applications are available and who is allowed to use them, a database is used. The database keeps detailed records about the applications including locations, who can use them and so on. This is sort of similar to Lisa's role, where the farmer's youngest daughter keeps detailed records. Farmer John needs a license to operate Pinklebury farm from the Ministry of Agriculture and this license, allocates the maximum number of people Farmer John can provide eggs to. Citrix XenApp Sites need licenses too and these contain limits for the maximum number of users who can access the Citrix XenApp Site. A Citrix license server is used to provide licenses to the XenApp Site. Citrix XenApp Sites have an administrator, a user who has the required rights to change how the Citrix XenApp Site is set up. Likewise, Pinklebury farm has an administrator, Farmer John, who can also elect to change how the farm is set up. Administration tasks can be delegated to other users in a Citrix XenApp Site by the main Administrator. Likewise, Farmer John can delegate his administration duties to his wife or he can hire new people to carry out specific or even all of his administration duties. The screenshot below, shows the basic components of a Citrix XenApp Site.